Just got back from a brief trip to Quebec. 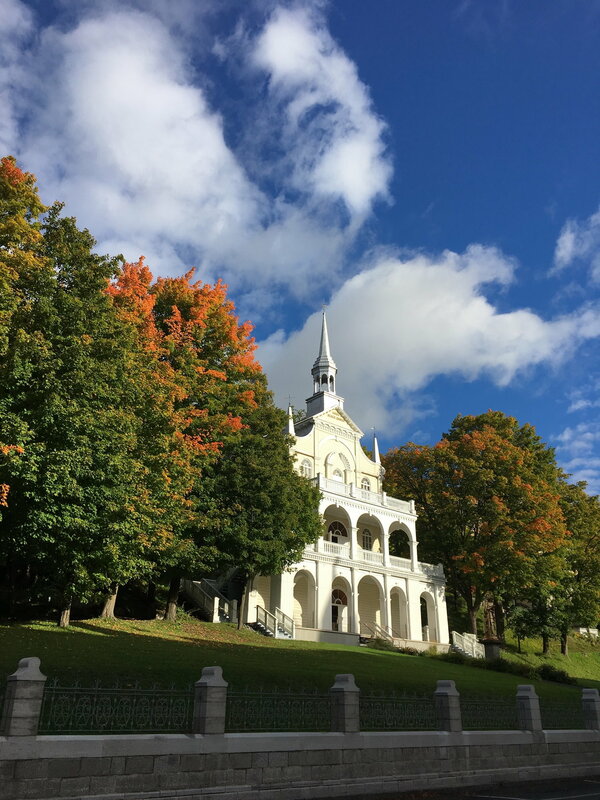 Thanks to zootsi for mentioning Charlevoix and xcountry’s comment about the weather in November. I moved up my travel to Sept. 28 through October 3 and was glad I did. Now that I’ve been there, I can imagine if it turns very cold in November, it can be a rough cold. I don’t know how people get about in the city with ice and snow on the stairs and steep hills. 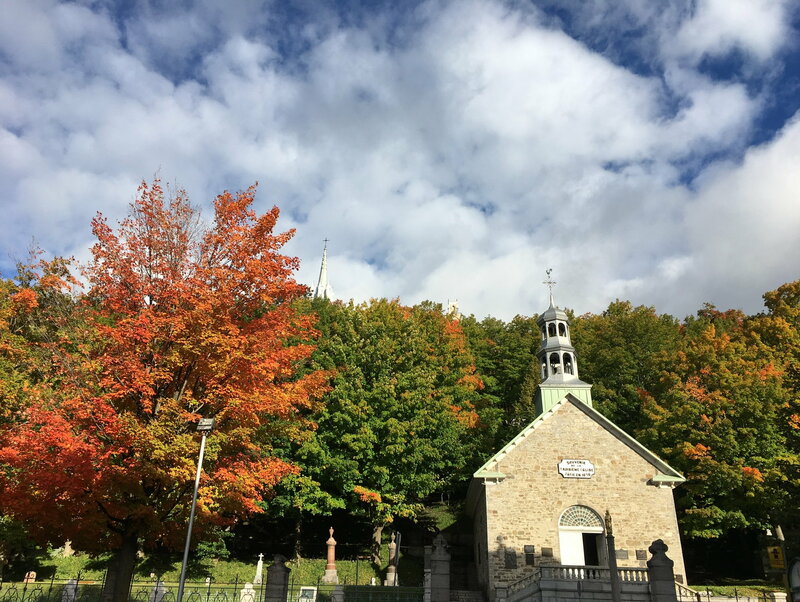 I stayed two nights in Sainte Anne de Beaupre and three nights in Quebec City. This was to be a low key getaway trip, without too much planning or scheduling (unlike some of my crazy, whirlwind trips). Mixed review. Good amount of space, but the carpet was vile, very stained. I accidentally forgot to pack my flip flops and was sorry. The bed was hard as a rock and there was road noise. It was very over priced for the nature of the facility. On the plus side, wifi was good and it was easy to get to and the equivalent of a block or two from the basilica. I was glad to have chosen a hotel within the walls of the old city rather than walking from slightly further afield. 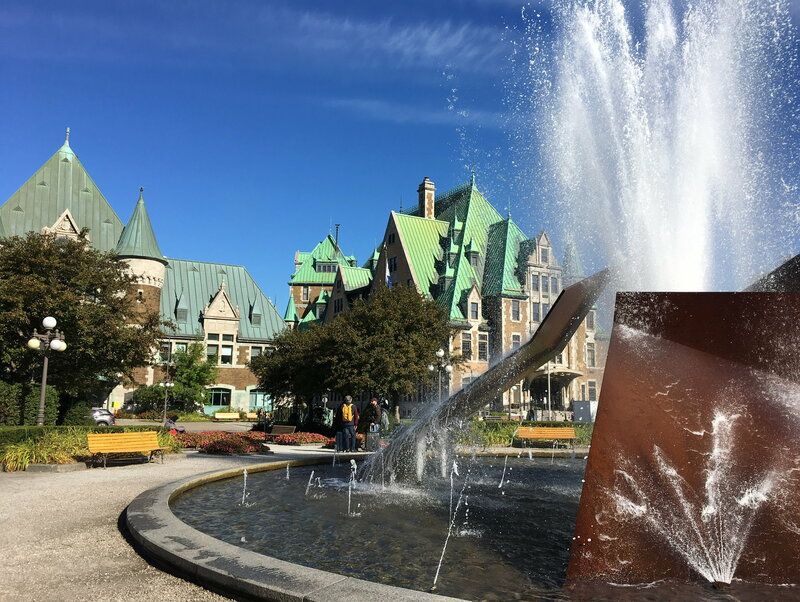 I think anyone considering a visit to QC should go for a hotel in the old quarter because it certainly makes life easier. Upper town or lower town is great. This hotel is in the upper town and is located on a quiet side street. The facility was clean and the wifi was good. The only real negative is the lack of an elevator. Luckily, I was on the second floor, so no big deal. Sept. 28 flight from Houston to Quebec City. Early morning departure was very painful. I live about 55 miles from the airport, so I had to get up extra early to make my 7 am flight. Terminal A can have some rough security lines. The lines on A South were terrible, which included the precheck line. I called a friend who works at the airport and he advised going to the north side and going through that line. That was much better! Uneventful flights to Quebec by way of Toronto on Air Canada. I was in my rental car (Enterprise, $58 USD for two days) and was on my way by 3 pm. I headed straight for Montmorency Falls. It was a gorgeous, mild day and I loved exploring this beautiful site. They offer ziplining past the falls, but I didn’t do it. It looked really fun though! I enjoyed the bridge across the falls and the walk down the hundreds of stairs to the base, where a cool, fine mist awaits the visitor. I took the gondola back up with about 20+ Chinese tourists. Quebec is immensely popular with Chinese tourists and it was amazing to see bus after bus of them on this trip. China sure has come a long way for the people to have the freedom and money to travel so far! I met several nice Chinese couples during the course of my trip when we took turns taking each other’s photos. After exploring the site, I had lunch/dinner at a snack shop at the top of the falls. It was a cheap, quick fast food meal of $8.65 CD and served its purpose. I was pretty tired by this point, so I continued my drive on to Beaupre where I checked into the Quality Suites. The front desk clerk, very friendly, directed me to the closest grocery stores where I could pick up some beverages and snacks for the trip. Rough night on the hard bed! Took my time getting up and moving and eventually made my way to the Sainte Anne Basilica. This is a large, beautiful church that would fit in easily in Europe. I then headed up the coast, stopping in Baie St. Paul, cute town and then on to Baie St. Catherine to inquire about the whale watching boat tours. The lady staffing the office was completely indifferent. I asked about which types of whales had been seen the last few days and her response was she “really couldn’t say”. That’s a bunch of baloney. I was put off by it and decided to move on since there wasn’t a boat available for at least another hour. I took the ferry over to Tadoussac. It was freezing on the ferry! It was a very pretty ride though. I scanned the water for whales, but didn’t see any. In Tadoussac, I wondered around, had lunch (Tomahawk restaurant – mediocre), but decided to skip a boat ride. In retrospect, I should have done the boat, but I was just so tired from the long travel day the previous day and my terrible night of poor sleep quality at the hotel. The drive is extremely scenic. Many of the trees had already changed colors. The coastal route had lots of ups and downs and plenty of warnings to verify one’s brakes. There were also a lot, I mean a lot, of warning signs about moose. I’m fascinated by moose and got really hopeful that I might see one given the volume of signs, but it was not to be. My evening was low key. I visited some of the shops near the basilica and had an early night. I started out the day visiting Canyon Sainte Anne, which was just a few minutes north. It’s a great place with very well maintained trails and bridges. You get a little exercise too as there are 187 steps to the bottom of the canyon. I arrived just as a tour bus arrived, so I hustled to get ahead of them on the trails. Next item on the agenda was to drive the perimeter of the Isle of Orleans. This an island that is predominantly farm land and homes, with apple orchards, lavender fields, strawberry fields, etc. My first stop was the Chocolaterie in the town of St. Peter. This place is famous for soft serve ice cream cones dipped in thick Belgian chocolate. It was delicious! The chocolate bars and treats in the store are very pricey, but I brought some back as gifts for family and friends. Sales tax in the Quebec area is 15%, so that was a bit of a surprise and helped drive up expenses. The drive is very scenic and relaxing. Each town has a church and I enjoyed visiting them. This relaxing drive took up the second half of my day and then I headed to the airport to return my car and head into Quebec City. Taxi fare into the city is a flat rate of $35 CD. It had started to drizzle and drizzle it did for the evening. 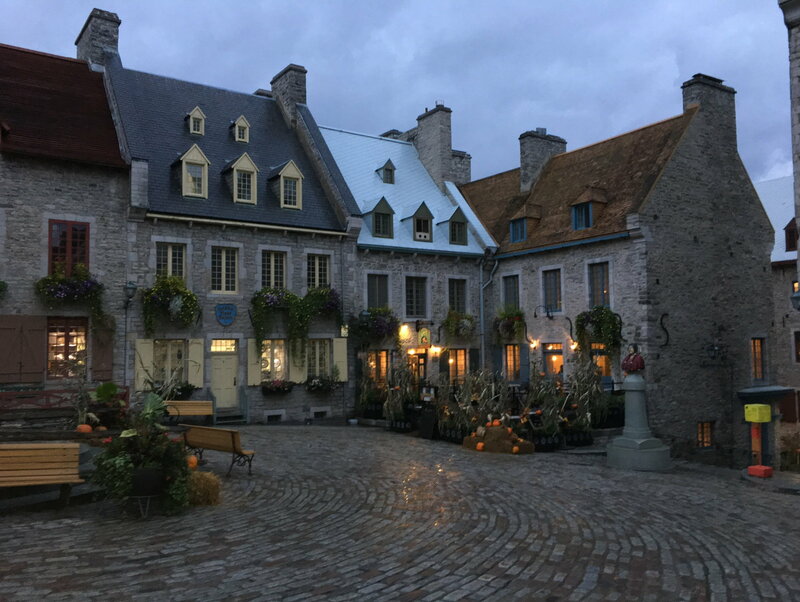 I wandered around Quebec City, just taking in the sights, going into shops, etc. I had dinner at the Chic Shack, a cozy burger joint. The food is fine, but nothing to write home about. As I sat in my window seat, I watched bus after bus go by with Asian tourists. 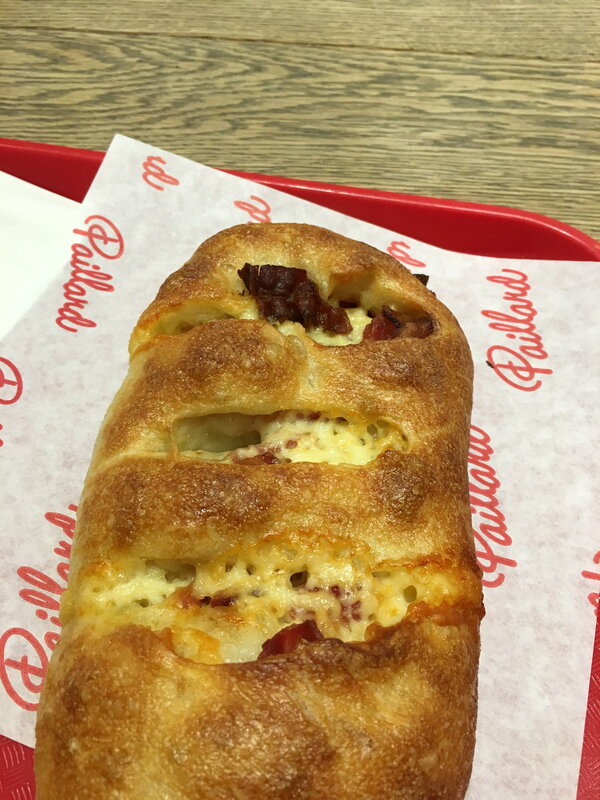 It was rather amazing. October 1 and 2 were spent wandering around. I visited both the Basilica of Notre Dame and the Holy Trinity Church. They are both lovely. I must say Holy Trinity has the most uncomfortable pews I’ve ever sat in. I attended a concert one afternoon and barely made it through. 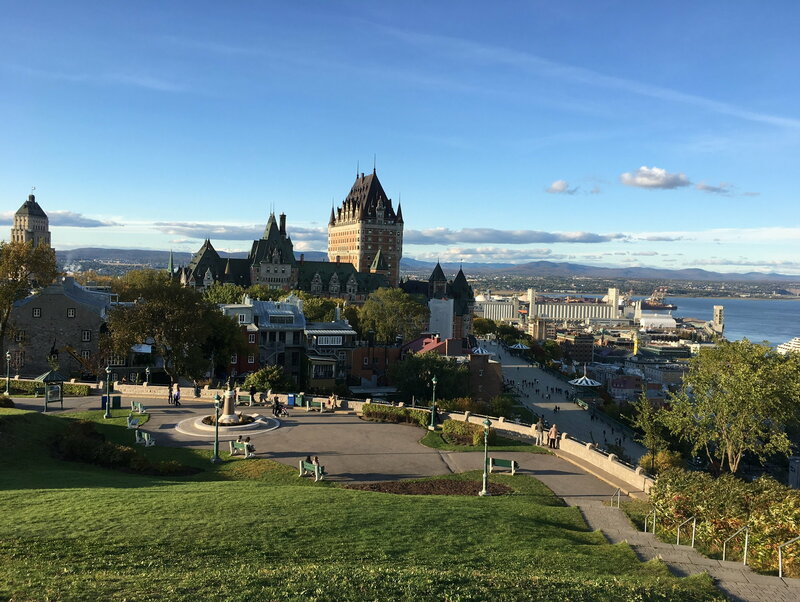 I visited the Citadelle, the Plains of Abraham, the lower town, etc. One afternoon, I stumbled upon a brass band from Norway playing next to the town walls not far from my hotel. It was a beautiful afternoon and it was a pleasure to sit on the stairs and listen to about 6 songs. The market in the port was pleasant and had some lovely looking produce. The Queen Mary 2 and other big ships were in port while I was there and now I want to take a cruise on the Queen Mary! A friend had told me she knocked out QC in a day and I thought she was crazy, but once I got there, I realized that it is a very small place (the old quarter). If I had to do it again, I would have added another day in the country and removed my second day in the city. The city is beautiful and charming, it’s just not filled with blockbuster sights. I was impressed with how clean both QC and the small towns are. The citizens take care of their towns and it seems like tourists are respectful. I loved how many hand sanitizer stations I saw at the airport and town. The airport is sparkly clean and well maintained. Uber ride to the airport was $30 CD. At the airport, I was randomly selected for a very thorough pat down. Fun. Not! My United flight to Newark was delayed by more than two hours (booo, United), so I missed my connection. They wanted to put me on a flight out of Newark that would have gotten me in after 11 pm. No thank you! I knew there was a 4 pm, so I pleaded to be put on that flight and so I was. Naturally, my carefully selected aisle seat was not an option on the new flight and I sat squashed in the middle seat of an enormous plane that is typically used for transatlantic crossings. I was not a happy camper being squashed. In the cramped quarters, I also lost my kindle, but didn’t realize until after I got out of the airport. I filed a report with UA, and to their credit, they notified me two days later that it was found. For a mere $19 (snort), they would mail it to me. I eagerly await its arrival tomorrow. 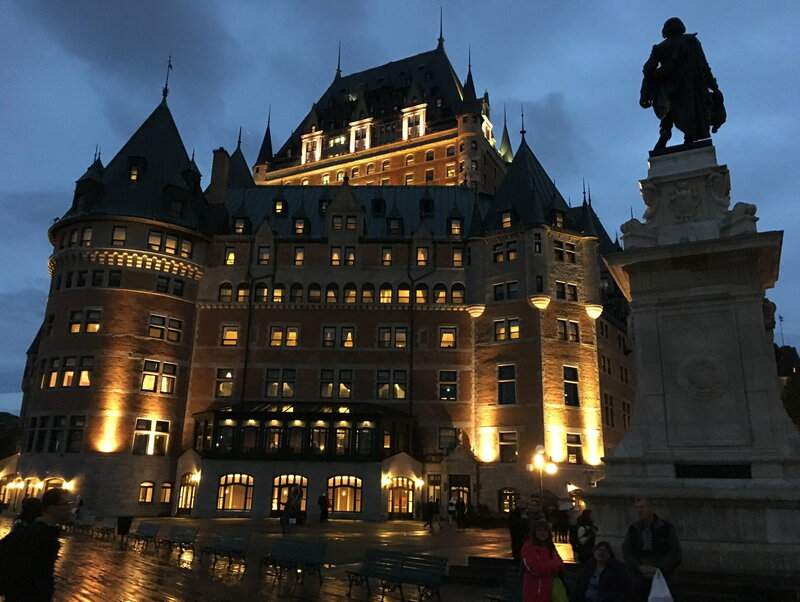 Quebec makes for a pretty, pleasant destination and I’m glad I finally visited. And, I miss Tim Horton’s already, home of the best blueberry muffins in a commercial enterprise. Aggiegirl - thanks for the nice report. I like your travel style as displayed on this trip. Don’t plan everything. Go for a drive. Walk around and see things. Perfect. 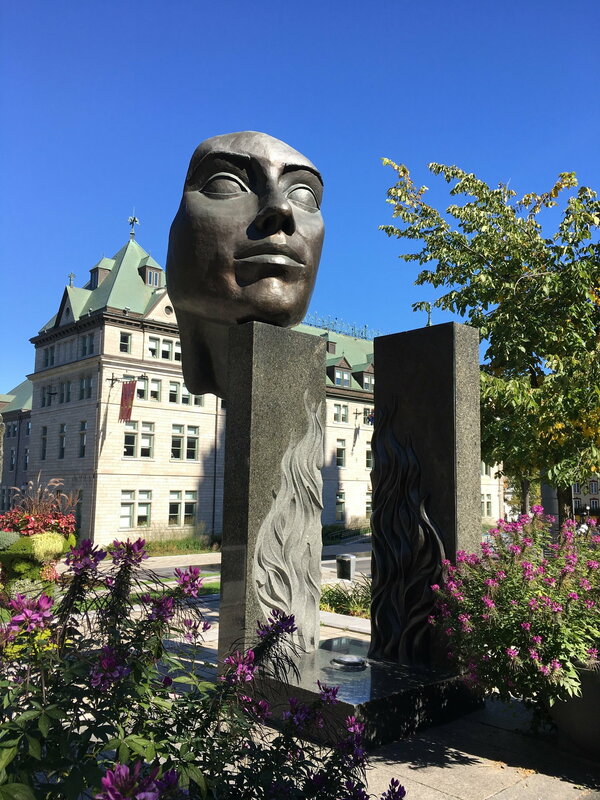 Nice report -- I like Quebec City and learned some things about the region. Public bus from Quebec aiport to Old City Quebec?